We are HUGE advocates of video (obviously) and have been doing community spotlight videos since 2015. Between our series #SanteeSaturdays and East County Eats, we’ve filmed over 170 episodes and are continuing to film more. Over these past years, we’ve learned a LOT about what it takes to maximize efficiency as well as optimize our relationships to get the best return possible. This blog post is meant to be a tell all of our best secrets when it comes to the before/during/after of filming a business spotlight, as well as the gear we use to make it all happen. Here is our 100th episode of #SanteeSaturdays and how we used this to transition into East County Eats. At this point we’re going to assume you have your theme (are you focusing on a specific geographic area, an interest, etc?). But how do you go about choosing from ALL of the businesses out there that fit your theme? Our most popular video to date has over 3,450,000 views and featured the Buffalo Chicken Mac & Cheese Tots from Funky Fries & Burgers – a big part of this was the fact that the dish we featured was so unique that the video was shared all over the country. Whissel Realty produces East County Eats as a part of our marketing efforts; it’s a way for us to give back to our community and to highlight some of what East County has to offer. The whole process takes about 60-90 minutes, and is completely free. The ONLY thing we ask is that you donate two $25 gift cards for us to raffle off on our Facebook Live Giveaways. We have had several videos reach over 100,000 and one has over 3 million (and counting). 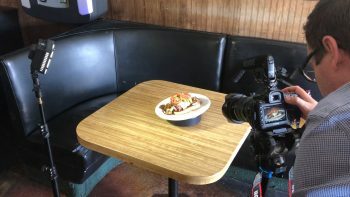 The day of your shoot: our team comes in and will do a quick 60 second interview with an owner, manager, or chef, and then we turn the focus over to the FOOD! We will film a total of 4 dishes being made (3 of your most unique/popular/beautiful dishes. The main dish we will film a second time with a different camera.) If you want the whole breakdown, here is a 5 minute video of the step-by-step process of what happens when we come to your shop. The more info you can provide to the business owner, the better. A lot of times they are nervous because they don’t know what to expect, so doing as much as you can to alleviate that will help you a lot in the long run. We also make sure we schedule the shoot when the business is slower – we don’t want to inconvenience the business any more than we have to. I want the owner/chef/manager to be completely focused on the video, so we ask that they over staff so the business can still operate while we are there. How can someone reach you? We have found that once the video launches, the next week the business gets flooded with new business (great problem to have). So we make sure to let them know so they can be staffed appropriately for it – nothing worse than having new customers come in only to have them leave without being helped. We do about 5 minutes of talking about the show, who we are and why we do it, a few minutes about the restaurant, then do a giveaway based on people we’ve selected who have completed the requirements (Shared, commented, and liked). 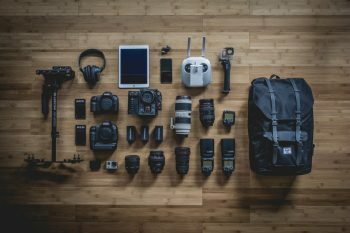 We all know that in order to make a great video, you don’t have to have the best gear available. While having high end gear can make your video look more professional and polished, it also takes a LOT more time and experience to use. I recommend you start out with something SIMPLE (aka smartphone) and grow from there as the need arises. There is a lot here, and a lot more that you will learn along the way. If this was helpful, we’d love to hear about it on our Facebook Group.